William Grant & Sons is marking Kininvie distillery’s 25 years of operation with the release of three of the first casks to be filled from its inaugural run. Kininvie Special Release #1 'The First Drops' contains some of the first whisky to be produced by the distillery in 1990. Cask numbers 8, 20 and 21 will be individually released in three separate single cask bottlings as Kininvie Special Release #1 ‘The First Drops’, each of which has been allocated for sale in Taiwan, mainland Europe and the UK respectively. Less than 1,600 350ml bottles have been produced in total from the first-fill American oak hogsheads. Non-chill-filtered and bottled at a cask strength of 61.4% abv, the expressions will retail from November for around £400 each. The Speyside distillery, situated on the grounds of Balvenie, was opened in June 1990 to provide malt whisky fillings for blends, in particular for William Grant’s blended malt, Monkey Shoulder. Since its launch there have been just three single malt bottlings released by the distillery – Kininvie 23-year-old Batch 1 for Taiwan in 2013, Batch 2 for the UK and Nordics in 2014, and a 17-year-old for global travel retail. This November William Grant & Sons will also launch Batch 3 of the 23-year-old, a limited run of 15,000 350ml bottles which will be available globally for £120, a 20% markup on the previous year’s release. 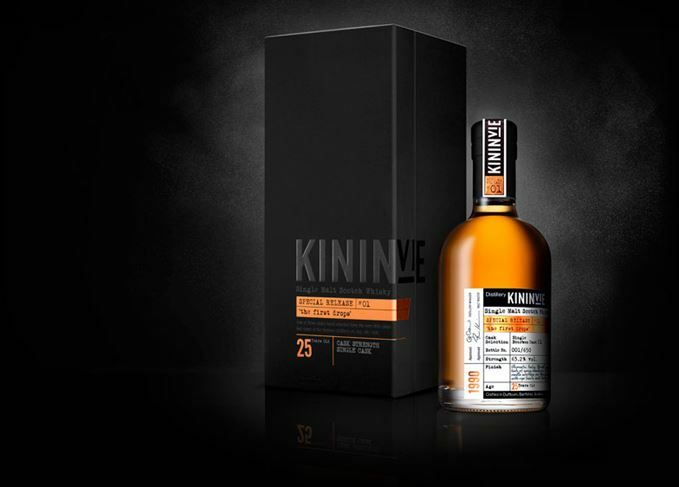 Kininvie 23 Year Old Batch 3 will be available from November this year for £125 per 350ml. Kevin Abrook, global whisky specialist at William Grant, explained the increase in price was down to the strength of the secondary market. ‘We’re led by supply and demand and in our case the consumer has been ahead of us in the sense they’re willing to pay higher prices, and you see that on secondary auction sites,’ he said. Releasing expressions at exclusively high ages with luxury prices has drawn criticism from some whisky enthusiasts that Kininvie is being positioned as an ‘elitist malt’. However, while Abrook confirms the strategy for Kininvie is to build its reputation as a luxury whisky, future releases won’t necessarily follow the same pattern. ‘In the short term we will be focusing on the high-end but our ambition over the longer term will be to build a bigger brand and to do that we need to be focusing on older expressions,’ he explained. Bottles of Dewar’s blended Scotch unearthed in former British Army garrison in Israel.